Let’s start with design decisions. The game is based around chapters. The hero, a naive young merchant’s son, is travelling to see the world, and mostly running into a bitter corrupt world. The first chapter, for example, has a companion betray you and the town being slowly weakened by a devious plot. 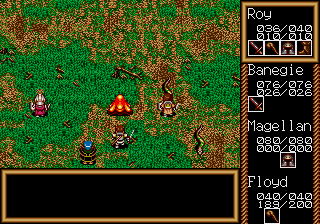 In this case, the plot is that strong men are lead off to fight bandits and killed, and your group of travelers were simply picked to be scapegoats. Throughout the game, the hero gains strength from remembering his sweetheart, Traysia. This is accompanied by a fairly syrupy melody and sepia toned images, mostly taken from the introduction. You’re expected to believe that, say, a princess and prince learns about love from a story about Traysia making him a crown of daisies. A thief returns your pendent after hearing the saga of Traysia. Near the end of the game, you struggle to fight a queen repeatedly with the threat being that he might forget the glory of Traysia. After a while this becomes almost silly. 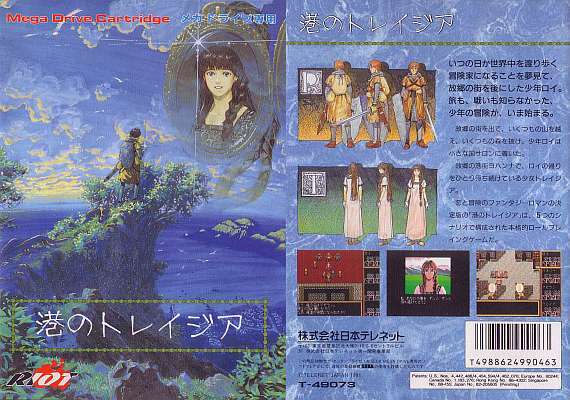 Both the front and back of the Japanese game box shows Traysia. The music isn’t that bad in the game. Certain tracks have a great feeling of foreboding. However, every staircase in the game is accompanied by loud thunking that drowns out the melodies. Exploration features large areas that are mostly empty. Sometimes, there are maze like areas or teleportation mazes. Graphical elements repeat throughout the entire game. While there are more annoying dungeons out there in rpgs, it still looks messy and like they’re not really sure what they’re doing. 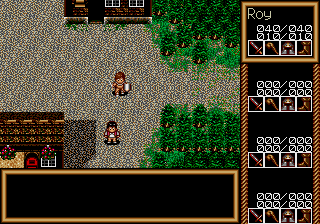 In the Empire of Sandra / Sandora, you go through at least a half hour of the game with no place to fight or to gain money, and there’s frequent ‘passages’ that have almost no indication that they are a path. One step to the right, I can talk to the shopkeeper. I’m including awkward controls under bugs. There’s some strange event pointers. For example, you get text about areas whenever you walk over a specific spot. So a welcome message, for example, appears when you’re leaving an area. You can duplicate a king via not talking to him when he’s supposed to tell you a mission, and then talking to him after he thanks you for finishing the mission. Equipping items feels awkward. You need to bring up the character selection box, select your character, select the items icon on the character, select equip in the items icon menu, and select the item. You cannot back out at any point to pick another character unless you go all the way out of the picking character process. Almost every sprite, in Traysia's landscapes, has dithering. 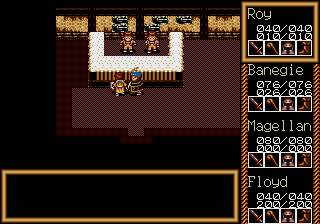 The carpet inside castles is dithered. It seems like the game intends you to wear armor and accessories like an ordinary rpg. Unfortunately, you can wear infinite items, which means your orphaned mage spends a good part of the game wearing about eight feathered hats. Your heroes, meanwhile, wear “sticks.” Due to this, you can basically complete the game without taking damage. Thanks to bad event programming, you can complete a sidequest for money and collect the reward repeatedly until you leave the room. There's a lot of propoganda in the game, usually with people lamenting how it leads to death. 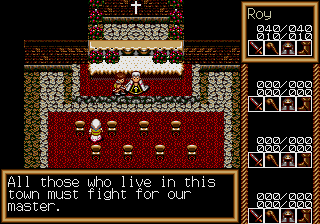 The battle system is ambitious and tries to be strategic. The backgrounds change throughout the game. In the end, Traysia feels like it had great ambitions, but it was hamstrung by the actual gameplay. The graphics feel rough. 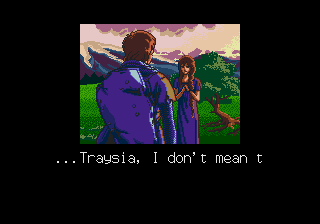 The attempts at pathos feels silly since the translation can’t handle the drama and the repeated evocations of Traysia falls flat. 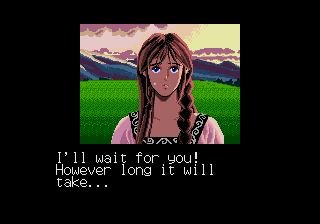 Still, the plot that survives the translation is intriguing, the music is pretty powerful, and the battle system is novel. The hero's goal is to see new lands, but all he wants is to return to Traysia. She cries as he leaves in the introduction.